Hiya dolls (and dudes if you're out there...lol)! :) This week's Bellarific Friday color challenge of aqua, pink, and orange caught my eye, so I thought I would go ahead and participate. I am so glad that I did as this card has turned out to be one of my favorite cards ever (out of the ones I've made anyway...lol). Isn't it crazy how our card making skills evolve over time? 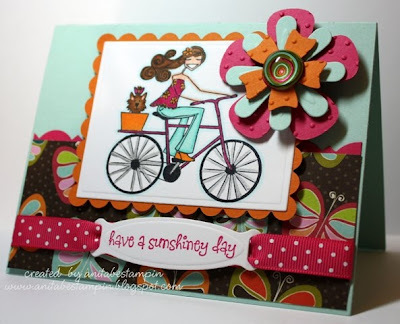 I am starting to get a little bit faster at card making too, which makes it all the more fun...woot woot! If you have a moment, swing over to the Stamping Bella blog to see the submissions for this week's color challenge. I saw your submission over on SCS and I LOVE your card. Absolutely adorable! This one is beautifully done too! I LOVE LOVE the bright cheery colors that you used! Great job! how adorable is this! went straight into my favorites! Beautiful!